Norman Rockwell’s ‘Rosie The Riveter’ cover for the May 29, 1943 edition of The Saturday Evening Post, was the first visual image to incorporate the ‘Rosie’ name. “Rosie the Riveter” is the name of a fictional character who came to symbolize the millions of real women who filled America’s factories, munitions plants, and shipyards during World War II. In later years, Rosie also became an iconic American image in the fight to broaden women’s civil rights. After the Japanese bombing of Pearl Harbor in December 1941 and the full involvement of the U.S. in World War II, the male work force was depleted to fill the ranks of the U.S. military. This came precisely at a time when America’s need for factory output and munitions soared. The U.S. government, with the help of advertising agencies such as J. Walter Thompson, mounted extensive campaigns to encourage women to join the work force. Magazines and posters played a key role in the effort to recruit women for the wartime workforce. Saturday Evening Post cover artist, Norman Rockwell, is generally credited with creating one of the popular “Rosie the Riveter” images used to encourage women to become wartime workers. Rockwell’s “Rosie,” shown at right, appeared on the cover of the May 29th, 1943 edition of The Saturday Evening Post. The Post was then one of the nation’s most popular magazines, with a circulation of about 3 million copies each week. In addition to Rockwell’s Rosie, however, another image would become the more commonly known “Rosie the Riveter” image. J. Howard Miller's 'We Can Do It!' poster was commissioned by Westinghouse and shown briefly in February 1942. In 1942, Pittsburgh artist J. Howard Miller was hired by the Westinghouse Company’s War Production Coordinating Committee to create a series of posters to motivate employees for the war effort. One of these posters became the famous “We Can Do It!” image — an image that in later years would also become known by many as “Rosie the Riveter,” though that was not the intended purpose at its creation. In fact, at the time of the poster’s release the name “Rosie” was in no way associated with Miller’s image. The poster — one of 42 produced in Miller’s Westinghouse series — was used exclusively within Westinghouse and not initially seen much beyond several Westinghouse factories in Pennsylvania and the Midwest where it was displayed for two weeks in February 1943. It was only years later, after the Miller poster was rediscovered in 1982 – some 40 years later, in fact – that his rendering began to be associated with “Rosie The Riveter,” and more importantly, women’s liberation and other causes. In terms of the origin of Miller’s “We Can Do It!” image, there have been some reports that an actual WWII woman worker may have been used as the source and/or inspiration – either from a photograph or as an in-person studio model. A 1942 wire service photo of one WWII female worker at Alameda Naval Air Base in California dressed in bandanna and work clothes has been suggested as a possible source, but one friend of Miller’s has noted that he rarely worked from photographs. Both images, however — Rockwell’s and Miller’s — were used to help motivate the WWII workforce, but in Miller’s case, perhaps only at Westinghouse factories. But Rockwell’s “Rosie,” in particular, helped encourage female workers to fill WW II production jobs. Sheridan Harvey of the U.S. Library of Congress has noted: “Rosie’s appearance on the Memorial Day cover of the Saturday Evening Post implied that her work might help save soldiers’ lives.” And in later years, up to present times, both of these images – Miller’s and Rockwell’s – have become iconic symbols of women’s rights struggles and are occasionally adapted for other causes and political campaigns as well. But in any case, it was during the World War II years that “Rosie the Riveter” got her start. 1942. Listen to song at NPR. Rosie the Riveter appears to have come first in song, not in art. In 1942, a song titled “Rosie the Riveter” was written by Redd Evans and John Jacob Loeb and was issued by Paramount Music Corporation of New York. The song was released in early 1943 and was played on the radio and broadcast nationally. It was also performed by various artists with popular band leaders of that day. The song became quite popular, particularly one version recorded by the Four Vagabonds, an African-American group — a version that caught on and rose on the Hit Parade. It seems likely that Saturday Evening Post artist Norman Rockwell heard this song, and possibly was influenced by it, especially since he wrote the name “Rosie” on the lunch box in his painting. In the Post’s cover illustration, Rockwell’s Rosie is shown on her lunch break, eating a sandwich from her opened lunch pail as her riveting gun rests on her lap. A giant American flag waves behind her. Rosie appears content, gazing off into the distance. However, Rockwell portrays her with some important details, from the lace handkerchief visible in her right hand pocket, to her foot placed smack on the cover of Adolph Hitler’s Mein Kampf at the bottom of the painting. But there was also something else in Rockwell’s Rosie. In early June 1943, after The Saturday Evening Post cover of Rosie had hit the newsstands and had been widely circulated, the Kansas City Star newspaper ran images of Rockwell’s Rosie alongside of Michelangelo’s Isaiah from his Sistine Chapel ceiling painting. The splash in the Star drew a lot more attention to Rockwell’s Rosie. Followers of Rockwell’s illustrations in those years knew well his penchant for touches of humor and satire. Rockwell had used a petite local woman as a model for his Rosie — Mary Doyle (Keefe), then a 19 year-old telephone operator — but he took liberties with her actual proportions to make his Rosie appear as a more powerful, Isaiah-like figure. “Righteousness is described throughout Isaiah’s prophecy as God’s ‘strong right arm’,” continued the Sotheby’s reviewer, “a characterization that must surely have occurred to [Rockwell] as he portrayed Rosie’s muscular forearms.” Rockwell’s Rosie also has a halo floating just above the pushed-back visor on her head. Rockwell had fun with his paintings, using some irreverent humor here and there, but also including the necessary serious messages and patriotic tone. Rockwell’s Saturday Evening Post Rosie was widely disseminated during the war. In addition to the magazine’s 3 million-plus circulation, Rockwell’s Rosie was also displayed in other publications, including The Art Digest of July 1, 1943. Rockwell’s “Rosie” was later donated to the U.S. War Loan Drive and briefly went on a public tour. However, Rockwell’s image of Rosie might have enjoyed an even wider circulation had it not been for the actions of the magazine’s publisher, Curtis Publishing. 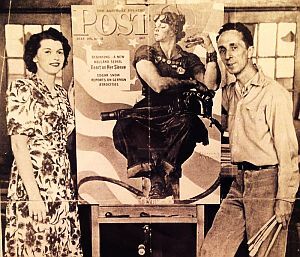 In 1943, Curtis initially used the phrase “Rosie the Riveter” on posters it distributed to news dealers advertising the forthcoming Post issue with Rockwell’s painting on the cover. However, according to author Penny Colman, within a few days, Curtis sent telegrams to the news dealers ordering them to destroy the poster and return a notarized statement attesting to the fact that they had. Curtis issued its retraction because it feared being sued for copyright infringement of the recently released song “Rosie the Riveter.” Rockwell’s painting of Rosie was then donated to the U.S. Treasury Department’s War Loan Drive, and then went on a tour for public display in various cities across the country. A ‘Wendy-the-Welder’ in 1940s’ shipbuilding at Richmond, CA. In June 1943, about two weeks after Rockwell’s Saturday Evening Post cover appeared on newsstands, the press picked up the story of a woman worker named Rose Bonavita-Hickey. She and partner Jennie Florio, drilled 900 holes and placed a record 3,345 rivets in a torpedo-bombing Avenger aircraft at the former General Motors Eastern Aircraft Division in North Tarrytown, New York. Hickey’s feat was recognized with a personal letter from President Roosevelt, and became identified as one of many real-life “Rosie the Riveters.” Other women workers doing riveting — as well as others generally who were filling heavy-industry “men’s” jobs all across the nation – e.g., “Wendy-the-welders,” etc. — also gained media attention during the war years. WWII-era photo showing Dora Miles and Dorothy Johnson at Douglas Aircraft Co. plant in Long Beach, CA. In early August 1943, Life magazine featured a full cover photograph of a woman steelworker, along with an inside photo-story spread of other “Rosie” steelworkers, some quite dramatic. The photographs were taken by Margaret Bourke-White, the famous Life photojournalist who was the first female war correspondent and the first woman to be allowed to work in combat zones during World War II. Life magazine cover photo of August 9, 1943 shows steelworker Ann Zarik at work with her torch. Bourke-White had spent much of WWII in the thick of things overseas, but also managed to do domestic stories such as the “Women in Steel” spread, which included at least a dozen photographs displayed in Life’s August 9, 1943 edition. These photos captured women at work in the American steel industry, including some taken at Tubular Alloy Steel Corp. of Gary, Indiana and Carnegie-Illinois Steel Company. Norman Rockwell’s portrayal of American ‘liberty girl’ in her ‘jack-of-all-trades’ mode, capable of doing many kinds of civilian jobs to help the War effort – September 4, 1943, Saturday Evening Post. The Saturday Evening Post used Norman Rockwell again to produce a cover for this campaign — a cover that appeared on its September 4th, 1943 issue. It was entitled “Rosie To The Rescue.” For this cover, Rockwell created a “liberty girl” dressed in patriotic clothes but cast as a jack-of-all-trades composite, capable of doing any number of civilian jobs — nurse, mechanic, telephone operator, milkman, farmer, etc. This “liberty girl” image did not resonate the same way that Rosie did, but Rockwell and the publishers were still doing their part for the War effort. Rockwell and The Saturday Evening Post were only part of a much bigger campaign to move women into the workplace. Motion pictures, newspapers, radio, museums, employee publications, and in-store displays were all involved. Some 125 million advertisements were produced as posters and full-page magazine ads. Some promotional films were produced as well. Hollywood actor Walter Pidgeon, working for the government War Bond effort, made a short film promoting the war effort in which he recruited a real “Rosie the Riveter” worker named Rose Will Monroe whom he met while touring Ford Motor’s Willow Run aircraft factory. The short film was shown in theaters between featured films to encourage viewers to buy War Bonds. Unrelated to the War Bond effort, a Hollywood movie called Rosie the Riveter was also made in 1944; it was a B-grade romantic wartime comedy made by Republic studios with Jane Frazee as Rosie Warren who worked in an airplane factory. Female trainees at Middletown, PA, 1944. The Middletown Air Service Command stockpiled parts and overhauled military airplanes. During WWII, Middletown’s workforce grew from 500 to more than 18,000, nearly half of them women. Woman working inside the tail of a B-17 aircraft at Boeing production line in Seattle, WA, 1940s. Phyllis McKey Gould was another worker at the Richmond, California Kaiser shipyard No. 2. She worked as a welder there, later recalling the work she did: “I’d never worked in my life,” she said. “I loved the look of welding, the smell of it… You’d look through really dark glass and all you’d see was the glow. You moved the welding rod in tiny, circular motions, making half-crescents. If you did it right, it was beautiful. It was like embroidery.” At the war’s height, women, many of them African-American, made up more than a quarter of the Richmond shipyards’ 90,000 workers. Women welders at Landers, Frary & Clark Plant, New Britain, Connecticut, 1943. In Maine during the early 1940s, Dorothy “Dot” Kelley was recently divorced, out on her own, and raising four children. After seeing women from the Portland shipyard cashing $600 checks, she quit her job at a Montgomery Ward department store and went to work at the South Portland Shipyards. She worked there helping build ships from 1942 until the shipyard closed in 1945. She worked nights so her days could be free for her children. Dot and other the women welders wore heavy clothes against the cold, and they wriggled into the ships’s tight spaces to weld its seams together. Her neck and chest became spotted with tiny burn marks from the sparks — common to other welders as well. But after the war ended, Dot Kelley was forced to work two jobs, and her children were sometimes left to fend for themselves at home. She was determined, however, to keep working and keep her family together. She lived to be 94 years old, and through her daughter, National Public Radio told her story in a December 2006 broadcast. Women working at the Redstone Arsenal in Alabama, 1940s. In Georgia, Eloise Strom, a young mother of two young boys, rose every morning before dark and rode an hour and a half in a car pool with five other women to go to work at the aircraft plant in Marietta. Some worked in the office, others worked in production. In the early 1940s the plant was called the “Bell Bomber plant,” later to become Lockheed-Martin. During WWII, it employed some 28,263 workers at its peak — about 10,000 of them women. It then paid well above the minimum wage. The factory produced B-29 bombers — some 668 in all. The B-29s were used mainly in the Pacific Theater to bomb Japan; they had a longer range than the B-17s used in Europe. The Marietta plant not only reshaped the work force, it also transformed Marietta from a sleepy town of 8,000 into a booming industrial center. Sante Fe Railroad ad singing the praises of its women workers. Near Hunstville, Ala- bama, a military ordnance complex known as the Redstone Arsenal, also used women throughout its facilities. By December 1942, about 40 percent of Redstone production line employees were women, and that share would rise to 60 percent or more on some production lines by war’s end. Dealing with munitions, chemicals, and other dangerous substances, the jobs at Redstone entailed a degree of risk, and several women were killed there during the WWII years, with a number of others injured. In Michigan, at Ford Motor Co., more than 30 percent of Ford workers in 1943 in the machining and assembly departments were women. Women at Ford plants built jeeps, B-24 aircraft, and tractors. They also became test pilots for the B-24s. And they operated drill presses, welding tools, heavy casting machinery and riveting guns. Another of David Conover's photos of 19 year-old Norma Jean Dougherty. Mexican American women workers on the Southern Pacific Railroad during WW II. During the WWII years, the government’s war-related “get-women-to-work” campaigning opened the door to women in the workforce, setting off a key change for women’s civil rights and altering the demographics of the workforce in later years. At the end of December 1941, there were about 13 million women at work. ‘Rosie the Riveter’ and other campaigns helped to increase that number to 15 million in early 1943. By 1944, there were 20 million women in the workforce, with 6 million of those working in factories. And according to the American Rosie the Riveter Association, the millions of Rosies who filled the factories helped turn out critical war materiel, including nearly 300,000 airplanes, more than 100,000 tanks, and some 44 billion rounds of ammunition. Women at Douglas aircraft plant during WWII. Women discovered a new sense of pride, dignity and independence in their work and their lives. Many realized their work was just as valuable as men’s, though for years, and to this day, an earnings disparity still exists. During the war years, however, a number of women workers joined unions, gaining major new benefits from labor representation. Black and Hispanic women also gained entry to major industrial plants, factory and other jobs throughout the country. But the fight for equal rights in the workplace and equal pay for women was just beginning, and would be fought over many years following WWII. America’s working women were praised during the war, but when the war ended they were encouraged to return to homemaking. As the women’s rights movement emerged in the 1970s, Rosie the Riveter imagery was called upon for use in campaigning and popular literature. By the 1980s, the historical importance of the WWII “Rosie workers” began to be revisited in books and film. 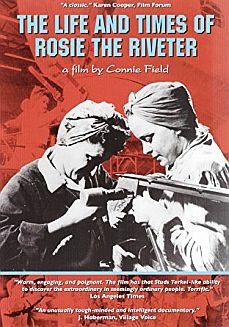 One documentary film entitled, The Life and Times of Rosie the Riveter, was made by Connie Field, who originally got the idea for the film after attending a California Rosie-the-Riveter reunion. The film, released in September 1981, is based on extensive research and some 700 interviews. It profiles five females who were working in low-paying jobs before the war and become wartime workers. The five “Rosies” recall their WW II-era experiences working in Detroit, Los Angeles, New York and San Francisco. Their stories are interwoven with archival recruitment films, stills, posters, ads, and music from the period. The film’s views contrast with some of the popular legends and mythology surrounding the Rosies of WW II, including the fact that many Rosies were denied opportunities to continue working once the war ended. The film is regarded as one of the best accounts of women working in heavy industry in World War II, and also of home-front life during those years. In the film’s first year, some 1 million viewers saw it, a very high number for a documentary. It has also won various film festival prizes and was dubbed into six languages. In 1996, it was selected for preservation in the United States National Film Registry by the Library of Congress as being “culturally, historically, or aesthetically significant”. In 1984, Goldie Hawn’s Hollywood film, Swing Shift, made with Warner Brothers, also built its storyline around the Rosie workers of World War II. That film also starred Christine Lahti, Kurt Russell, Fred Ward and Ed Harris. Swing Shift focuses more on the personal relationships of its WW II-era female workers played by Hawn and Lahti while their husbands are away in the war. This film, however, also fairly portrayed what happened to women workers at the war’s end as male workers returned and the female workers were no longer needed. In the 1990s, Rosie the Riveter imagery and stories continued to pop up in various venues. Smithsonian magazine did a story on WWII era Rosie poster art in its March 1994 edition, putting the J. Howard Miller “We Can Do It” Rosie on the cover. In November 1998, the U.S. Postal Service authorized a new first-class postage stamp honoring the WW II-era working women, also using the “We-Can-Do-It!” Rosie. Back in the real world, however, thousands of older Rosies who had actually worked in the wartime production frenzy, were getting up in years, and many were recalling their experiences in their wartime jobs. Some were having reunions, while others began communicating with one another. In 1998, the “American Rosie the Riveter Association” was formed in Warm Springs, Georgia and is today headquarterd in Birmingham, Alabama. By 2004 this organization had 1,400-members. In California, meanwhile, something else was afoot: a National Park (follows below the Rockwell sidebar). Over the years, Norman Rockwell’s Rosie the Riveter has generally yielded in popularity to the J. Howard Miller/Westinghouse “We Can Do It!” poster girl. Copyright restrictions on Rockwell’s Rosie in subsequent years meant it was less frequently reproduced. The Miller/Westinghouse poster image, on the other hand, was without such copyright limitations, and over the years, appeared in numerous forms — on coffee mugs, magnets, t-shirts, and mouse pads. Still, Rockwell’s original painting had some interesting travels. …By the 1990s, certainly, Rockwell’s body of work had received serious attention of historians and art critics alike… And in the art world, Rockwell’s Rosie enjoyed a considerable following. In the 1940s, after Rockwell’s painting was donated to the government War Bond effort, it went on public tour, as did other works of art during those years. Items on these tours were sometimes offered as prizes in raffles as a way to increase public interest and contributions for the war effort. Reportedly, at one of those events — believed to have been when the painting was displayed at the Strawbridge & Clothier store in Philadelphia, Pennsylvania — Rockwell’s original Rosie was raffled off and won by a Mrs. P. R. Eichenberg of Mount Lebanon, Pennsylvania. After that, the painting appears to have been acquired by the Chicago Pneumatic Tool Co. on E. 44th St. in New York city, where it was hung in a display window next to a placard explaining Rosie’s history. Also included in that window display were some riveting hammers identical to the one Rockwell’s painting placed in Rosie’s lap. After its window display, it appears that Rosie was held by Martha Parrish and James Reinish of New York. Rockwell's Rosie: sold for millions. Sometime in the year 2000, the original Rockwell Rosie painting was sold to an anonymous collector for $2 million. By 2002, that collector decided to sell. In the meantime, Rockwell’s Rosie had been part of an all Norman Rockwell exhibition entitled “Norman Rockwell: Pictures for the American People,” which had run at the Solomon R. Guggenheim Museum in New York from November 1999-February 2002. In 2002, Rockwell’s Rosie was sold at Sotheby’s for $4.95 million. Rockwell’s Rosie had illustrated the exhibit brochure’s back cover as well as interior pages. After the exhibition, it was then featured on the cover of Sotheby’s May 2002 American Paintings auction magazine. The auction was held on May 22, 2002. The bidding on Rockwell’s “Rosie the Riveter” painting began at $1.5 million and proceeded in $100,000 increments until it was sold for $4,959,500. The buyers were a husband-and-wife team — Kelly Elliott owner of the Elliott Yeary Gallery of Aspen, Colorado, and her husband, Jason Elliott, a partner in Ranger Endowments Management of Dallas, Texas. Isabella Keiser, 7, checks out Rosie’s lunch pail. Photo, Leonardo Carrizo, Columbus Dispatch. “‘Rosie’ was the first piece of art I ever appreciated back in grade school,” Jason Elliott, 32, explained to a New York Times reporter. “…She’s colorful, she’s calm and this is my favorite representation of America.” Kelley Elliott, 29, who had done the bidding for the Rockwell painting, said it would be displayed in the Colorado gallery for the summer. No longer range plans for the painting were announced at that time, but Jason Elliott indicated that he wanted the painting to be seen. “I don’t want it locked away in a room somewhere,” he said. Rockwell’s “Rosie,” however, would be sold again. In June 2009, it was reported that Alice Walton, daughter of Sam Walton, founder of Walmart Stores, acquired the Rockwell painting for $4.9 million. The “Rosie the Riveter” painting is currently housed at the Crystal Bridges Museum of American Art in Bentonville, Arkansas. The museum, which opened in November 2011, is largely the creation of Alice Walton and the Walton Family Foundation. Beyond “Rosie the Riveter,” Norman Rockwell’s work today is still admired broadly throughout America. Museum exhibits of Rockwell’s work at The Saturday Evening Post and elsewhere have appeared over the years throughout the country. In Columbus, Ohio, for example, during February-March 2009, there was a “Rockwell’s America” exhibit at the Ohio Historical Center in Columbus, Ohio. A photo from the Rosie the Riveter portion of that exhibit appears at left. There is also the Norman Rockwell Museum in Stockbridge, Massachusetts, where Rockwell lived the last 25 years of his life. Founded in 1969, it holds the world’s largest collection of original Rockwell art — some 574 original works as well as the Norman Rockwell Archives of photographs, fan mail, and other documents. Rosie the Riveter Memorial looking out toward Richmond Marina & San Francisco Bay beyond. This site was formerly Kaiser Shipyard No. 2. On October 14th, 2000, a “Rosie the Riveter memorial” was dedicated in Richmond, California, a location on the San Francisco Bay where one of WWII’s amazing engineering feats took place — with women workers playing a key role. For it was here that Kaiser shipbuilding devised mass-assembly techniques to more quickly produce the vessels that were needed in the war. In that undertaking, Richmond became a Mecca for workers, as other factories, including a Ford Motor plant, were also converted to war-time production of jeeps and other equipment. In the 1990s, with some of these sites deteriorating and/or fading in memory, a few local officials sought to improve their locale and draw tourist and public attention to the historic role women workers had played at some of these locations. A modest “Rosie the Riveter” memorial was first proposed at the site of one the Kaiser shipbuilding docks, and work began in the late 1990s. But this memorial soon sparked, and became part of, a much larger vision and plan that would come to encompass the “Rosie the Riveter WW II Home Front National Historical Park” — a U.S. National Park with multiple venues and historic sites along Richmond’s 22-mile waterfront. In the U.S. Congress, legislation authorizing the “Rosie the Riveter WWII Home Front National Historical Park” was submitted by U.S. Rep. George Miller (D-CA), U.S. Senator Barbara Boxer (D-CA), and U.S. Senator Diane Feinstein (D-CA) in March of 2000. The bill was signed into law by President Bill Clinton in October 2000. “Preservation is not only for parks and wilderness areas,” said Congressman George Miller at the bill’s signing. “We are also committed to using our resources to preserve historic sites that help tell the story of America’s development, and the Rosie the Riveter Home Front National Historical Park will stand as a lasting tribute to these brave women who played such a crucial role in winning the war.” Today, the park includes a number of exhibits on the “homefront” and “Rosie-the-Riveter” contributions to the WWII-era production that took place in Richmond. Other exhibits for the park are also planned. View toward Bay from hull sculpture looking down walkway. Engraved pavement sections are visible as well as “image ladders” with period photographs & shipyard memorabilia. At the October 2000 dedication of the Rosie the Riveter memorial, for example, hundreds of visitors and dignitaries came to the ceremony, not the least of whom were some 200 “Rosies” returning to the former workplace to revisit their past. The memorial, which includes a sculpture of part of a ship’s hull under construction, evokes the ship building that went on there, with a granite walkway that stretches the length of a Liberty ship the to the water’s edge. The granite walkway includes etched words from women workers. The site also includes “image ladders” with photographs and memorabilia, and a timeline of events on the home front and individual memories of the period. Norman Rockwell with Mary Doyle Keefe, the model for the 1943 'Rosie-the-Riveter' Saturday Evening Post cover. Additional stories at this website on notable women include, for example, those on author and ecologist Rachel Carson and her book, Silent Spring; Olympics star and pro golfer, Babe Didrikson; and singer and TV celebrity Dinah Shore. The topics page, “Noteworthy Ladies,” offers more than 40 story choices on women who have made their mark in various fields. Additional history on the work of Norman Rockwell can be found at “Rockwell & Race, 1963-1968,” and more on Saturday Evening Post cover art is included at “Falter’s Art, Rising”(John Falter covers, 1940s-1960s) and “U.S. Post Office, 1950s-2011” featuring the work of Stevan Dohanos and other Post illustrators. 1995 CD of WWII 'songs that won the war'. Connie Field’s film on the WW II ‘Rosies,’ called “an unusually tough-minded and intelligent documentary”. WW II worker I.D. badge, Redstone Arsenal. 1940s 'Can't Win Without Them' poster. Poster for the B-grade 1944 romantic comedy film made by Republic studios. 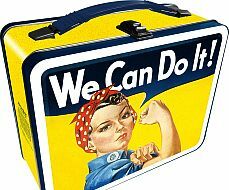 Rosie the Riveter lunch box or travel tote box. Transcript of video presentation by Sheridan Harvey, “Rosie the Riveter: Real Women Workers in World War II,” Library of Congress, Washington., D.C., date of presentation not stated. “Women’s Work,” Click! The Ongoing Feminist Revo-lution (web exhibit), ClioHistory.org/click/, 2015. “Northrop Workers Show 35,000 Visitors How Planes Are Built, Los Angeles Times, December 28, 1942, p. A-1. Norman Rockwell’s “Rosie The Riveter” illustration appears in, The Kansas City Star, June 6, 1943. Jeannette Guiterrez, “Naomi Parker Fraley, The Original ‘We Can Do It!’ Gal,” Diary of A Rosie.com (site focused on saving Willow Run bomber plant & more), March 11, 2016. “U.S.O. to Open Women War Workers’ Club,” Los Angeles Times, June 21, 1943, p.13. “We Can Do It!,” Wikipedia.org. Aline Law, “Women Do a Lot to Keep ‘Em Flying; Tour of Plane Plant Reveals Proportion High,” Los Angeles Times, November 28, 1943, p. D-13. “Rosie the Riveter Keeps Her Glamour in Shape; Special Beauty Treatments at Douglas Plant Retain Girls’ Looks for After-War Home Life,” Los Angeles Times, October 1, 1944, p. 12. Article on the Norman Rockwell “Rosie the Riveter” painting, Art Digest, April 15, 1945, p. 18. “Riveter Rosie Asks Man’s Pay, Woman’s Rights,” Los Angeles Times, December 10, 1944, p. 13. “Women War Workers Quit Plants in Droves,” Los Angeles Times, December 17, 1945, p. 1. The Life and Times of Rosie The Riveter, a documentary film produced and directed by Connie Field, 1981. C. Gerald Fraser, “Rosie’s Life after the War Was Not So Rosy,” New York Times, Saturday, May 2, 1981, p. 13. Maureen Honey, Creating Rosie the Riveter, Amherst: The University of Massachusetts Press, 1984. Sherna B. Gluck, Rosie the Riveter Revisited, Boston, Twayne Publishers, 1987. Laura L. Dresser and Sherri A. Kossoudji, “The End of a Riveting Experience: Occupational Shifts at Ford After World War II,” American Economic Review, May 1992. “Powers of Persuasion: Poster Art From World War II,” The National Archives, From an Exhibit in Washington, D.C., May 1994 – February 1995. Penny Colman, Rosie the Riveter: Women Working on the Home Front in World War II, Crown Books, 1995. Dr. Kaylene Hughes, “Women at War: Redstone’s WWII Female Production Soldiers,” paper originally written by Dr. Kaylene Hughes, Senior Historian, U.S. Army Missile Command Historical Office, for presentation to the U.S. Army Historians Conference, June 1994. The paper was adapted to book-format by Dr. Hughes in early 1995. Tony Marcano, “Famed Riveter In War Effort, Rose Monroe Dies at 77,” New York Times, June 2, 1997. National Public Radio (NPR), “Rosie the Riveter” [Re: Rose Monroe’s death], All Things Considered, June 2, 1997. Megan Garrett, “Folk Hero Rosie The Riveter and Women’s Labor,” Lewis & Clark College, Portland, Oregon, April 23, 1998. U.S. Army Ordnance Corps. “Rosie the Riveter: More Than a Poster Girl,” October 1, 1998. Joanne Klement, “Stamp Will Honor `Rosie the Riveter,” Knight Ridder/Tribune News Service, November 10, 1998. M. Paul Holsinger, “Rosie The Riveter,” War and American Popular Culture: A Historical Encyclopedia, 1998. Judy Larson and Maureen Hart Hennessey, Norman Rockwell: Pictures for the American People, New York, 1999. Maureen Honey, Creating Rosie the Riveter: Class, Gender, and Propaganda During World War II, University of Missouri Press, 1999. Shirley Ann Wilson Moore, To Place Our Deeds: The African American Community in Richmond, California 1910-1963, University of California Press, January 2000. Patricia Leigh Brown, ‘Rosie the Riveter’ Honored in California Memorial,” New York Times, October 22, 2000. “Rosie Gets Her National Park as Clinton Signs Miller’s Bill,” RosieTheRiveter.org., Wash., DC, October 25, 2000. Carol Vogel, “Inside Art: And Rosie’s Still Riveting,” New York Times, April 5, 2002. James Barron, “The Model for ‘Rosie,’ Without Rivets or Brawn,” New York Times, May 19, 2002. Dara Mitchell, “Riveting Rosie,” Sotheby’s Auction Preview, American Paintings, 1334 York Avenue, New York, May 22, 2002. James Barron, “Boldface Names: An Admirer Lands ‘Rosie’,” New York Times, May 23, 2002. Penny Colman, Letter to the Editor, “It’s Just ‘Rosie’,” New York Times, May 24, 2002. Jeffry Scott, “Efforts To Recognize ‘Rosie the Riveters’ Picks Up Momentum,”The Atlanta Journal-Constitution, December 7, 2004. “Women in War Jobs – Rosie the Riveter (1942-1945),” Ad Council.org. National Park Service Website, Rosie The Riveter /WWII Homefront National Park. Aerial view of featured sites at Rosie The Riveter National Park. “Yank, the Army Weekly,” Wikipedia.org. Ford Motor Co., “The Real Story of ‘Rosie the Riveter:’ A Ford Motor Company Employee,” Ford.com. Lincoln Cushing, “‘Rosie the Riveter’ Is Not the Same as ‘We Can Do It!’,” DocsPopuli.org. James J. Kimble and Lester C. Olson, “Visual Rhetoric Representing Rosie the Riveter: Myth and Misconception in J. Howard Miller’s ‘We Can Do It!’ Poster,” Rhetoric & Public Affairs, Vol. 9, No. 4, Winter 2006, pp. 533-569. “Rosie The Riveter: Wars and Battles, World War II Home Front,” U-S-History.com. National Public Radio (NPR), “My Mother’s Story: Dot the Welder,” by Joyce Butler, on Morning Edition by Michael Garofalo; senior producer for StoryCorps Sarah Kramer, December 15, 2006. Margaret Bourke-White, “Women in Steel” (photographs), Life, August 9, 1943. Carol Vogel, “A Billionaire’s Eye for Art Shapes Her Singular Museum,” New York Times, June 16, 2011. Website, Crystal Bridges Museum of American Art, Bentonville, Arkansas. Roger Hurlburt, “Monroe An Exhibit Of The Early Days Of Marilyn Monroe — Before She Became A Legend — Brings The Star`s History In Focus,” SunSentinel.com (Florida) January 6, 1991. “Marilyn Monroe,” Webster’s Online Dictionary. “USA Edition, YANK USA 1945,” WarTimePress.com, (re: note on Marilyn Monroe). Julie Zauzmer, “Rosie The Riveter, 70 Years Later: Women Who Stepped Into Nontraditional Jobs During World War II Remember Their Work With Pride,” Washington Post, Aug. 11, 2014, p. B-1.